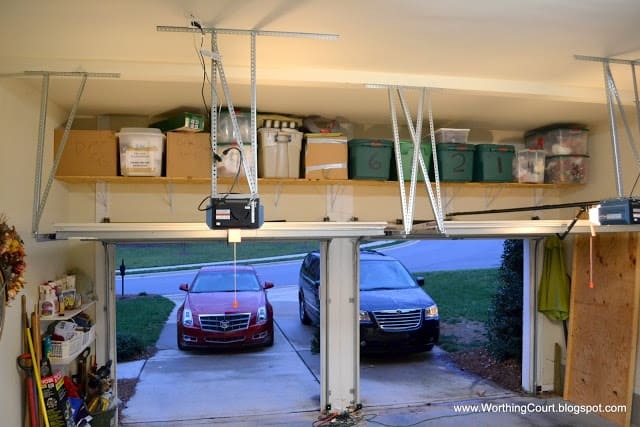 UPDATE: Enjoy this tip for organizing and storing your Christmas decorations. These photos were taken in our former home, but I still use this same method in our new home. Click HERE to see my new style! 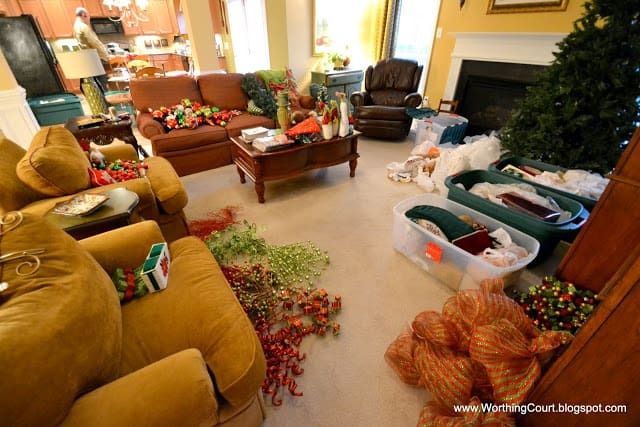 This easy method for organizing my Christmas decor was a life saver for me this year. 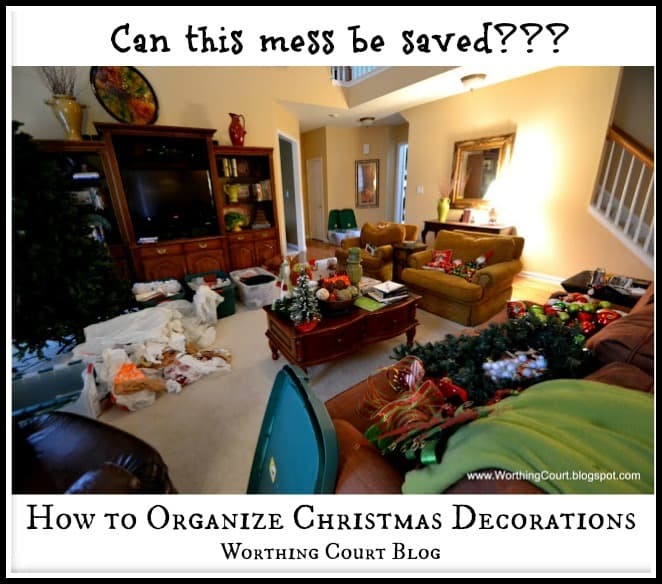 So – I’m reposting my Christmas decor organizing method from last year in hopes that it can help you too. Every single year, I vow and declare to myself that I will organize my Christmas decor when it comes time to put everything away. Every single year, I only halfway do it.Every single year, when I’m ready to decorate the mantle (or the tree or whatever), everything is never all in one box. Every single year, I have to pull down all of the boxes to find all of the stuff for the mantle (or tree or whatever).Every single year, my whole house is torn up for a solid three weeks while I try to get it all decorated. And every single year, I’m tired of it all before Christmas even gets here because of how much the mess stresses me out.Well…I hope I’ve come up with a way to help myself next year! It isn’t rocket science or anything earth shattering. It’s just a list. Let me explain. 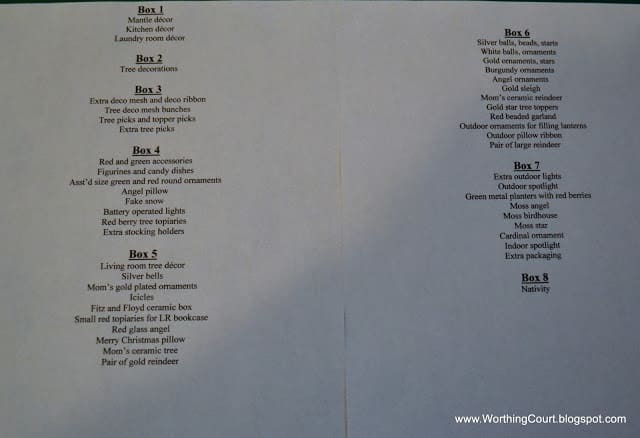 I’ve tried several times to attach a list of what’s in each box to the exterior, but the lists fall off before the next Christmas gets here because of the temp changes in the garage where my Christmas boxes are stored. So…I wind up having to pull all of the boxes down at one time. Chaos reigns!!! So, in case you’re looking for a way to organize your Christmas decor and in case you’re interested, I’ll explain my thought process. I already have eight large storage bins, so I couldn’t justify buying all new, clear boxes that I could see through. I had to come up with a way to use what I already have and figure out how to identify what’s in each box without trying to attach a list to the outside (since they won’t stay attached). Believe it or not, the mess that you see in this picture is really an organized mess. The coffee table holds all of the decorations out of the kitchen (not counting dishes that get stored in cabinets year round), one end of the couch holds all of the mantle decorations, the other end holds all of the tree ornaments, all of the glittery picks used on the tree and in the tree topper are on the floor, the deco mesh poufs used in the tree are in a pile on the floor, the glittery tree garland is in a pile beside the mesh on the floor, miscellaneous items used to create vignettes are in one of the chairs and a yardsale pile has been started in the other. The pile of paper beside the tree is just the packaging material that I use to re-wrap fragile items with when I put them away. Whew! I basically wound up using a box for each pile of stuff. In some cases, more than one pile would fit in a box. As I packed a box, I wrote out of list of what was in that box. My handwriting is so sloppy that I wound up typing and printing the list. After all of the boxes were packed and the list was typed, I laid the list on top of the items in one of the boxes. The list will be the first thing that you see when the box is opened. Here are the boxes all packed and ready to be stored until next year. Pay no attention to the glitter all over the floor – this is pre-vaccumming. Oh and no comments about my dorky looking numbers! Once everything is packed, Pookie places all of the boxes on this handy dandy shelf that he added in our garage. 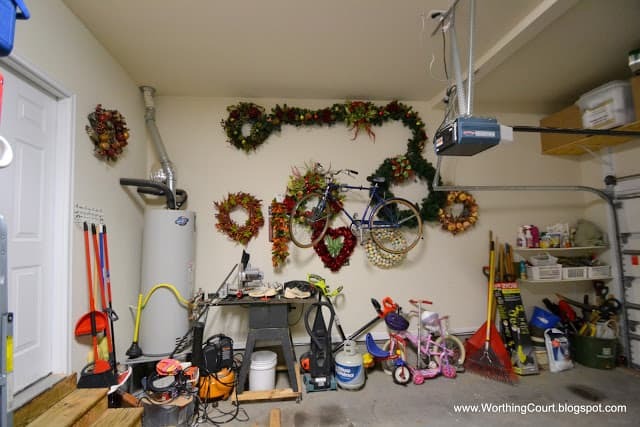 Just in case you’re wondering, the garland and various seasonal wreaths are all hanging on nails that we hammered into this wall. No pretty pictures here, but hopefully my idea will help you out if you struggle with some of the same things that I do. 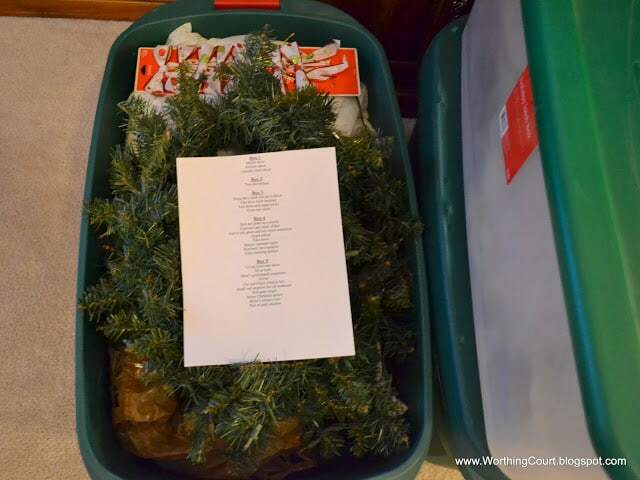 I really wanted to try this a we packed up this year, but instead hubby decided we would label each box with masking tape: stockings/stuffed decor, glass ornaments, miniature trees, beads/garlands, nutcrackers, etc…. So, that is our plan. If it doesn’t work, I am definitely doing this next year! Suzy, I think this is a great idea. It will work for me for some of my decor, but I also have random decor that I use from time to time but not every year. I am bound and determined to organize and do some purging this year. I think I will try to apply your method. It just might work for me. 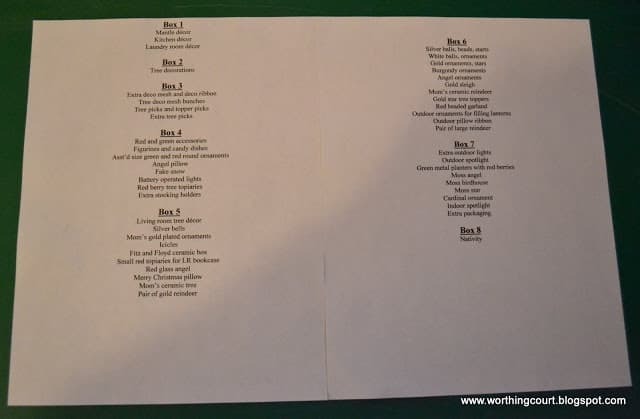 Do you keep a master list other than the one in the box to reference too before you get down the boxes? 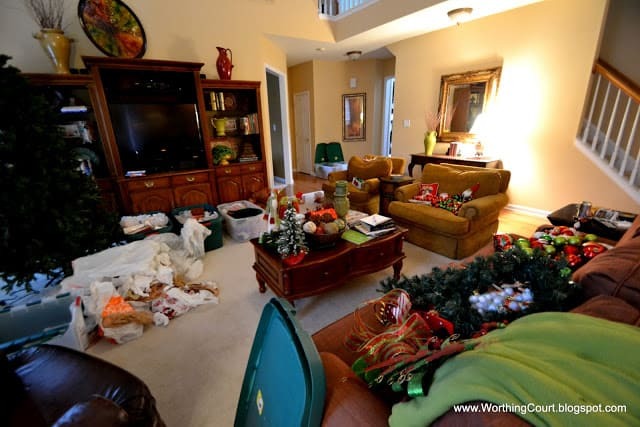 Great idea for organizing the Christmas decor. I haven’t taken mine down yet — having another set of visitors this coming weekend and they want to see my holiday decorations. I’m looking forward to putting it all away after that, though! Just found this link on Pinterest. I’m not joking when I tell you this. 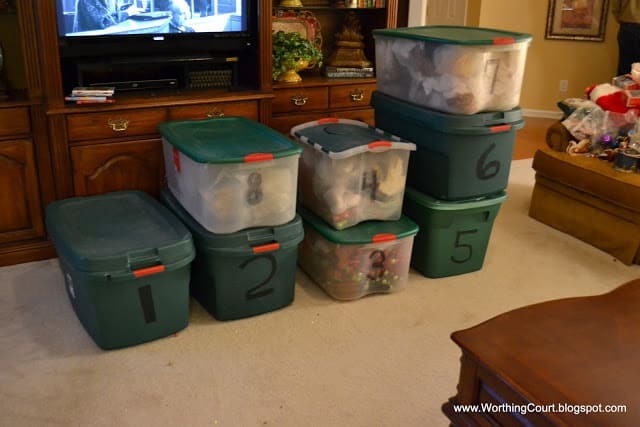 I have 47 VERY well organized 16 qt storage containers as well as 11 tree storage bags. What I need is a VERY well organized shed to store them in because it’s taken over the area under the basement stairs and the garage attic. As I went thru the pictures, I felt as if I was looking at my own living room. My problem is that I have tons of different kinds of ornaments. This year I used so very few of them. Glad Christmas is over! Great idea! I also take photos and keep them on my phone of how I have decorated each area of my home. I have so many decorations and my memory gets shorter each year!